Among the Songhay people of Africa, Fara Maka is a significant culture hero. He is described as being a giant of a man who fished and grew rice for a living. Stories about Fara Maka have him using his long beard to catch fish and to eat at least one hippopotamus a day. As a result of his divine heritage, Fara Maka also had magical powers. The Songhay are able to trace their origins back to the 8th century B.C.E. when Aliman Dia came to the Niger River. Aliman Dia had iron weapons that enabled him to overpower the people living there along the river. Namely the sorko or fishers and the gow or hunters. By uniting the different villages in the area, Aliman Dia founded the first Songhay dynasty. Aliman Dia’s descendants ruled until around the 15th century when the Sonni replaced them. Fara Maka’s father was a mortal man by the name of Nisili Bote, a fisherman by trade. His mother’s name is Maka, a river spirit. As a result, this is from whom Fara got his mystical and divine heritage from. This one is a bit odd, Fara Maka found a girl in a termite mound who gave birth to his two children. Among the Mali people, Fara Maka or Fara Maka’s wife’s name is Nana Miriam. Fara Maka is the father of Wango and Weikare. Not a whole lot else is known about them other than their children in turn become the sorko of the Songhay tribe. The most significant story involving Fara Maka is that of his battle with the water spirit Zinkibaru for control of the Niger River. Zinkibaru has caused the fish to eat Fara Maka’s rice crops. In response to this, Fara Maka fought the water spirit and in the process, won a magical guitar from it. After his battle with the river spirit Zinkibaru, Fara Maka soon got too overconfident with his abilities and victory. This angered Dongo, the god of lightning and thunder. Dongo displayed his anger towards Fara by burning many Songhay villages and people. Eventually Dongo cooled down enough and summoned Fara to him. Dongo demanded that Fara humble himself in order to stop the attacks on the villages by offering up music, praise-poems and animal sacrifices. Dongo further told Faran that if he would organize these festivals, that he, Dongo would enter into the bodies of the dancers for a spiritual ecstasy and help all those living along the Niger River. After Dongo’s forced meeting with Fara Maka, the first Songhay Possession Ceremony was held. Even today in modern era, this ceremony is still performed. The most important people of the Songhay Possession Troupe are the Sorko, the praise-singers to the spirits. The Sorko are direct descendants of Fara Maka Bote, keeping alive the traditions, folklore and religion of the Songhay. Among the people of Mali, Fara Maka is a hero who slew a monstrous hippopotamus known as Mali. Mali had eaten all of Fara Maka’s crops. 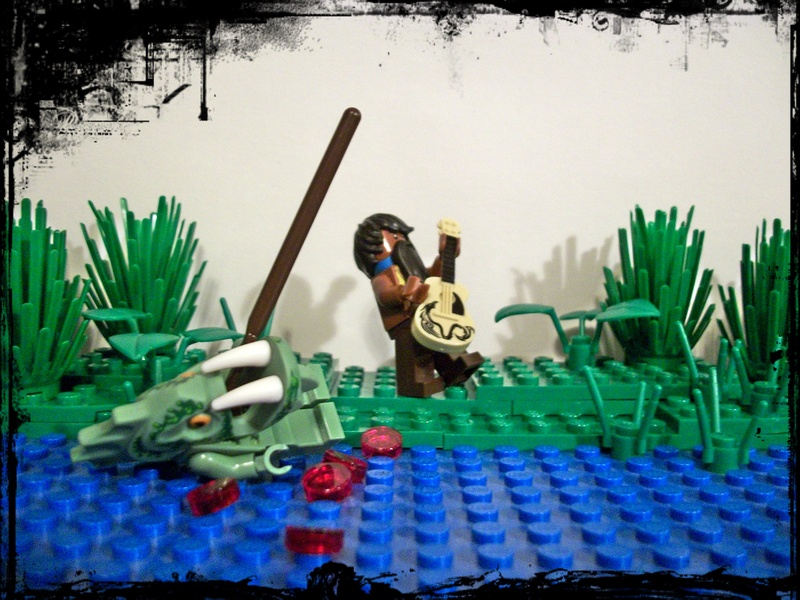 Fara Maka tried to kill the monster hippo using his spear and sending out as many 120 black hounds to attack the beast. Fara Maka failed and was eaten in the process by some accounts. His wife, Nana Miriam used a spell to paralyze the monster Mali and finally defeating it.